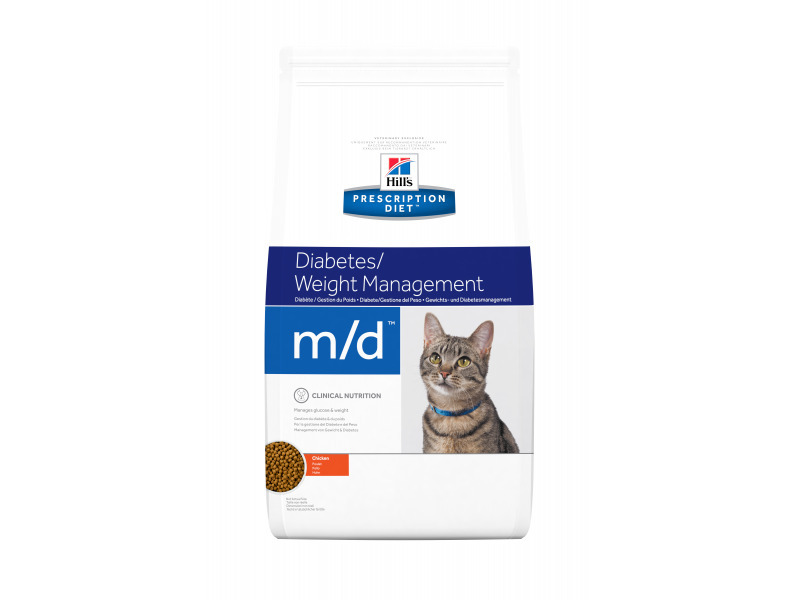 Hills m/d diet for cats is Hills answer to the question about feeding significant amounts of carbohydrate to cats. Many vets and animal nutritionists feel that the appropriate diet for cats is high in protein and low in carbohydrate - much as a natural carnivore diet would be. Hills prescription diet feline m/d - is a low calorie, high fibre diet with the highest levels of L-Carnitine to more effectively reduce weight and increase muscle mass while keeping cats feeling full. These ranges are a starting point only, because cats' needs vary.Adjust the feeding amount to maintain optimal body weight. A 156g can is equal to 40 grams of the dry food. Carbohydrate Low Encourages fat metabolism to provide energy. Helps improve insulin sensitivity and blood glucose regulation. Protein High Helps preserve lean body mass. Helps provide a more uniform supply of glucose via gluconeogenesis. L-Carnitine Supplemented Helps improve glucose utilisation. Contributes to faster weight reduction and maintenance of lean muscle mass. Superior antioxidant formula Added Neutralises free radicals that can lead to diabetic complications. Chicken and turkey meal, maize gluten meal, ground maize, greaves meal, animal fat, cellulose, L-lysine hydrochloride, digest, potassium citrate, calcium sulphate, L-carnitine supplement, calcium carbonate, taurine, potassium chloride, salt, DL-methionine, L-tryptophan, vitamins and trace elements. Naturally preserved with mixed tocopherols citric acid and rosemary extract. Minced with Liver (minimum 30%): Pork, pork liver, maize starch, cellulose, soy protein, animal fat, calcium carbonate, calcium sulphate, dicalcium phosphate, rice flour, taurine, potassium chloride, DL-methionine, L-carnitine supplement, vitamins and trace elements. Monitor insulin dosage closely. After changing to m/d™ Feline the requirements for insulin may decrease significantly. It is recommended that when switching to m/d™ Feline the effect of insulin should be monitored; initially the dose may need to be reduced by 25-50 %, especially if a cat has been receiving a high dose of insulin. Do not allow obese cats to fast for more than 2 days. 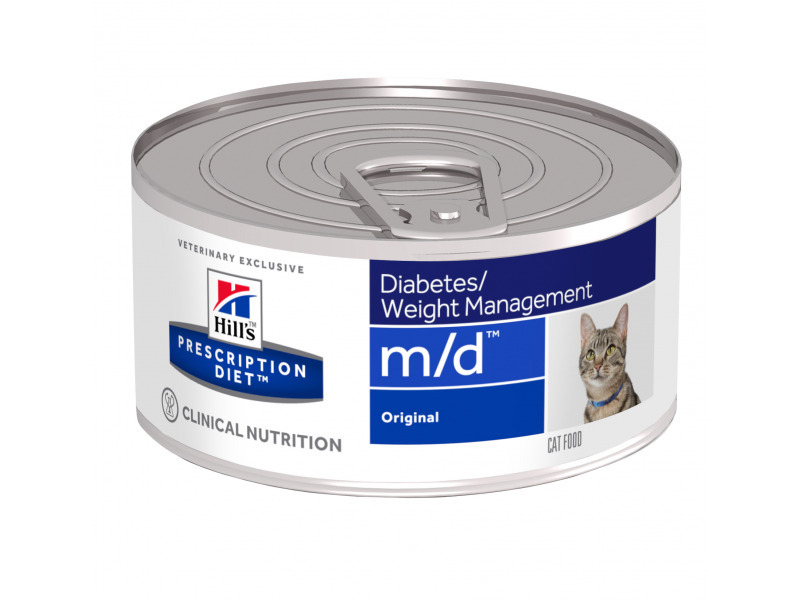 Below are some recent questions we've received regarding Hill's Prescription Diet m/d Diabetes/Weight Management Cat Food, including answers from our team. Which of your product would you recommend to control weight for my cat? I would suggest a high protein, low carbohydrate diet. Hills m/d might be appropriate or you could try one of the Orijen, Ziwi Peak or Acana products. Ideally check with your vet before ordering any of the Hills prescription diets. Hi my cat has just being diagnosed with diabetes she's 15 yrs , my vet recommended your food , happens she loves it , strange she wont touch your dry food. Sorry! We only have one flavour of this diet in a wet form. Others might be introduced in time, but for now you will have to stick to the one flavour. It is highly palatable and should be accepted well by your cat.